How many times have you come home with a good looking plant from a nursery that, after careful planting in a suitable position and appropriate watering, died within a few weeks or even days? Here is my, as usual unorthodox view, of what may have happened: I believe that, like us, plants have an immune system that helps them cope with micro-organisms and recover from injuries (must search the internet for this). That prize specimen may well have been raised in a near sterile environment and had not had the opportunity to develop its immune system muscles - antibodies or whatever. Being suddenly confronted with the onslaught of a multiple of other organisms in a normal garden soil it just could not cope and hence died. Common sense, you may say - and then ask why nurseries grow in near sterile conditions and what can an enthusiastic gardener do when nurseries present us with desirable plants for our gardens that are 'hothouse' beauties? High volume commercial nurseries aim to grow plants as fast as possible for a quick turnover. They achieve this by providing plants with a hormone accelerated, nutrient and moisture rich environment. Such conditions are also ideal to grow fungi, algae and other micro-organisms, and not inhibiting their growth would result in a high loss rate. Hence growing media are heat treated, fumigated, drenched or whatever else it takes to remove interfering organisms. Retail bagged potting mixes on the other hand are not treated enough to kill the bacteria that causes Legionnaire's disease, so be aware when you are potting (use a mask and wet the mix to reduce dust). Fungus spores float around in the air and thrive particularly well in a growing shed with misting system. To eliminate them completely would require filtered air facilities such as used for tissue culture. Nurseries sterilise containers and cuttings as well as apply fungicide, algaecide and pesticide at regular intervals. It is not an 'organic' process (wash hands after visiting a nursery). Hardening the plants off in the open starts to approach a normal environment - sun, wind, spores, etc. When this process is a bit short for many possible reasons, the plant may still be 'soft' when they come into shops. Whether a particular plant I buy is in this category can be difficult to ascertain, but if I suspect that it could be the case I do not rush to plant it out the next day. I keep it for a few weeks in my propagating area where nothing is ever sterilised or fungicide treated. I am pretty conscientious about watering so that 'death in pots' has been very rare. I fully understand why nurseries adopt these methods. It is not that the plants will have a short life for the customer, but to achieve good volume of production in a short time at a price that the customer is prepared to pay. 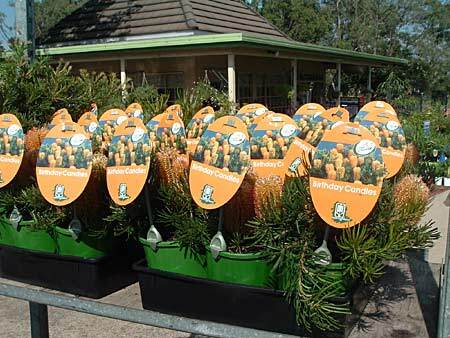 Nursery industry profit margins are not high, and it is a seasonal and perishable product. They have to make a living. From the newsletter of the Nowra Group of the Australian Plants Society, April 2004.